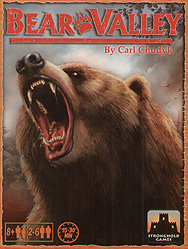 In Bear Valley, you must be the first to survive the treacherous wilderness and escape to the safety of the camp at the end of the valley. A unique map, featuring beautifully illustrated realistic art, is built by the players as they explore the wilderness, so no two games will ever play the same. Dive into caves, row canoes, cross bridges, climb mountains, and cut through treacherous underbrush as you stop at nothing - except bears - to be the first to reach base camp. Can you survive and escape Bear Valley?